Home / Blogs / Are We Doing Enough for Malaria Research? I used the World RePORT online app to investigate some key questions raised by the recent Malaria Futures for Africa report. Earlier this year, the Malaria Futures for Africa (MalaFA) report was released. A large opinion research study, incorporating views and insights from top malaria experts in government, academia, and non-governmental organizations across Africa, the report presented a consensus that increased funding and improved delivery of interventions will be needed if the world is to stand a chance of meeting the 2030 malaria targets set by the World Health Organization (WHO). The report also contained strong support among policy makers and experts that there is a need to expand operational and implementation research—meaning research to identify, define, and test strategies to enhance the quality, coverage, and otherwise performance of public health interventions­­—to ensure that effective interventions are implemented through national health systems as required to address local needs. Among other points, experts also cited the importance of countries contributing domestic funding towards malaria research and control, rather than relying solely on international donor support. As a first back-of-the-envelope approach to answering these questions, I decided to use World RePORT, an online, open-access interactive database of health research projects hosted by the U.S. National Institutes of Health (NIH), and with sponsorship from a number of other big international health donors, including the NIH itself, the UK’s Medical Research Council (MRC), the Bill & Melinda Gates Foundation, the European Commission (EC), the Canadian Institutes of Health Research, and the Wellcome Trust. The site aims to increase research transparency, with an emphasis on highlighting the collaborations required between foreign and domestic institutions when conducting health research in low- and middle-income countries. It’s worth noting up front that the World RePORT database does not include data on all funded projects, and likely underestimates locally funded initiatives in favor of larger-scale internationally-supported efforts, and with a bias towards funding sources publishing records in English. However, given the breadth of funders it does cover, I thought it would still provide a useful first-order insight into the geographical distribution of funding for malaria in Africa, as well as the types of research projects being funded. To tackle the first question, and see whether funding is going to the countries with the highest risk of malaria, I started off by finding a relatively recent malaria transmission risk map for Africa, to identify informally the countries which are at highest risk. The image below is adapted from a paper by Noor et al., published in 2014 in The Lancet. 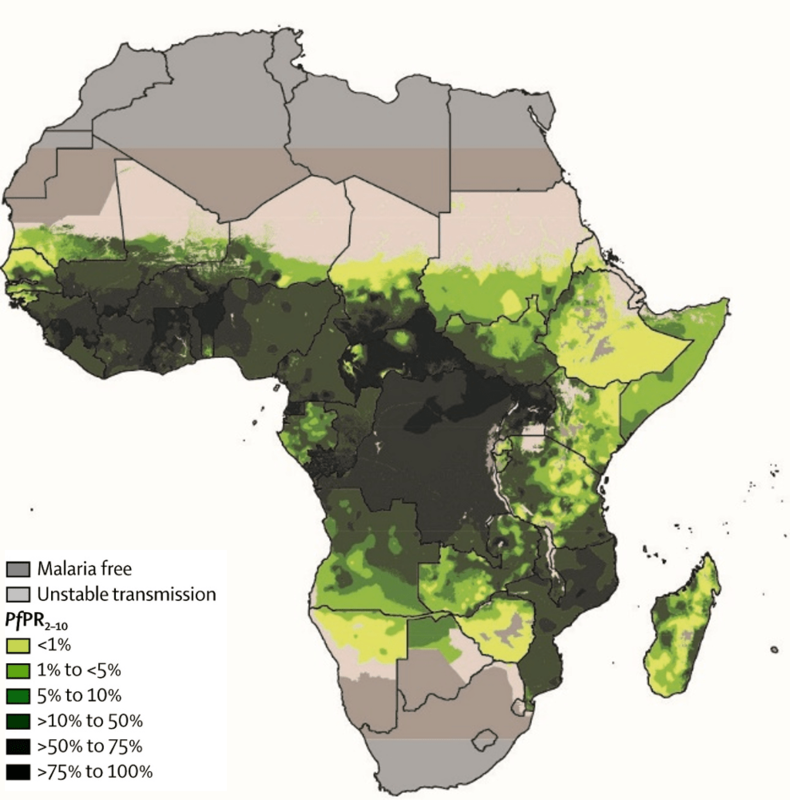 It shows estimated malaria transmission risk across Africa in 2010; the darkest green areas represent the areas with the highest malaria transmission risk. On a country level, the highest risk areas include most of West Africa (and particularly Sierra Leone, Ghana, and Togo), Central Africa (notably the Democratic Republic of Congo [DRC] and the Central African Republic [CAR]), and certain parts of East Africa (such as Uganda and Mozambique). I also considered malaria burden, which takes into account the number of estimated and reported cases per country; according to the World Malaria Report 2017, the countries in Africa with the highest burden of malaria included Nigeria, DRC and Mozambique. Together with India, these countries account for 80% of the global burden of malaria cases. I used World RePORT to search for all records of research projects on malaria between 2012-2016 for the continent of Africa. Below is a screenshot of the resulting map display, which shows the number of records per country. As you can see under “Program Details Data”, there were a total of 1,753 records found; a single project may have multiple records (if there are multiple PIs or study sites, for example), hence the number of points on the map is considerably lower. I should also note that due to the large number of records, I did not validate each record in this case (more on the potential importance of this below). However, the project distribution on the map shows an interesting pattern, with a large majority of funded projects being based in East Africa, and especially Kenya, Tanzania, and Uganda. Southern Africa (South Africa and Malawi) also has a substantial number of projects, followed by a few countries in West Africa, dominated by Anglophone Ghana and Nigeria, though Burkina Faso also has a similar number. Only three projects are based in DRC, six in Mozambique, and none whatsoever in CAR. Of course, research capacity is likely to play a major role in this pattern; Kenya and Uganda, as examples, have several research institutions which are not only internationally very highly regarded, but have long-standing relationships with partner institutions in the US, Canada and Europe, as well as with major donors. Similarly, the only research institution funded in the Gambia is the MRC unit The Gambia at LSHTM (London School of Hygiene and Tropical Medicine), representing one of the MRC’s flagship research capacity endeavors on the African continent. Language may be another factor, with major US- and UK-based funders, including many of those who support World RePORT, potentially favoring implementation of projects in Anglophone, rather than Franco- or Lusophone, countries. However, funding from the European Commission (EC) and European & Developing Countries Clinical Trials Partnership (EDCTP) are also included in the World RePORT database, which would not necessarily be expected to have an Anglophone bias. If anything, the lack of research being implemented in Central Africa may highlight an important need to build research capacity in this region, and allow for future malaria research funding to be targeted to local institutions in these high-risk, high-burden countries. Within this large number of research records, I also wanted to know what types of projects are being funded, and specifically, how many relate to implementation or operational research, cited as such a critical need by the MalaFA report? To narrow down the records, I adjusted my search terms, searching first for “malaria” AND “implementation”, and then by “malaria” AND “operational”, and combined the resulting records into a single spreadsheet for validation. As previously, I looked across all the years available on World RePORT (2012 to 2016) and focused on Africa. Once I had the full list of records, I went through each one, checking the project abstract in World RePORT to: 1) identify duplicate records (which I defined as records with the same identification number, same title, same principal investigator, same research organization, and same study start/end dates) and 2) exclude any research projects that were not in fact focused on implementation or operational research on malaria. The combined search terms resulted in a total of 243 records. The figure below shows the map display of results, with results using “operational” as a keyword on the left, and using “implementation” as a keyword on the right. Overall, there were more records located under “implementation”, though there was greater geographical distribution of records containing “operational” as a keyword, especially in West Africa. However, of the 243 total records, 114 were duplicates. Of the remaining 129, a mere 36 actually focused on malaria implementation research or operational research. The majority of the remainder were projects focused on HIV/AIDS, including two large consortium projects in West and Central Africa respectively, which only included malaria tangentially as a potential co-morbidity with HIV/AIDS, and not as a direct focus of the research project nor from an operational/implementation research perspective. The remaining 36 records were comprised of 17 discrete projects, funded by the EC, EDCTP, MRC, NIH, the Swedish International Development Agency (SIDA) and the Wellcome Trust, and taking place across 13 countries: Benin, Burkina Faso, Cameroon, Ethiopia, Gambia, Kenya, Malawi, Mali, Senegal, South Africa, Tanzania, Uganda and Zambia (see the graphs below). The majority of records related to institutions in East Africa (14 out of 36), followed by Southern Africa (12 out of 36). These results reflect again that malaria implementation and operational research projects also do not seem to take place in the countries and regions of highest need, suggesting opportunities for building enhanced linkages and collaborations with researchers, particularly in Central Africa, to encourage more research initiatives that would help to address the region’s high burden of malaria. Of course, this quick analysis has many limitations; I could have used more exhaustive search terms, or manually validated all malaria records to ensure no examples of implementation or operational research slipped through. As mentioned earlier, the World RePORT database is also not comprehensive of all funding sources. However, I hope this analysis serves as a start, and also demonstrates the potential value of a large, open-access funding database on health research in order to answer important questions related to funding access, equity, and distribution, given the importance of the role of research in meeting international disease control and elimination targets.